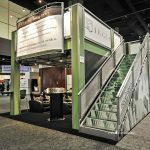 trade show Archives – P.O.P. 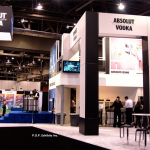 Exhibits Inc.
Trade shows are an excellent way to generate leads and to introduce your product to prospective clients. 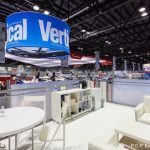 However, it is easy to be overlooked by merchants who may have a bigger booth and a flashier display than smaller exhibitors. This is why it is important to know a few tricks that will help you stand out among even the savviest merchants. 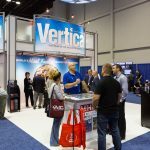 Here are six things you can do to stand out among the trade show crowds to make the best impression possible. 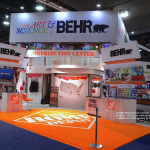 Start long before you get there: Spend the weeks and even months before the trade show thinking out your exhibit and how your will present your product or service to the audience. Make sure that you have handouts like T-shirts, fliers, pencils and other promotional items ready. Wisely use audio-video materials: Use interactive A/V presentations to draw attendees to your exhibit like months to a flame. Your well produced presentation can be as simple as a monitor a keyboard and a computer or as intricate as a wide screen display so long as it is engaging, informative and interesting. Be hospitable: People enjoy doing business with people who make them feel special and appreciated. Provide your prospects with pleasant conversation, refreshments, etc., to let them know that they are the focus of your marketing efforts. Hold a giveaway contest: Giveaways are an excellent way to build a mailing list and if your company does not hold one you may be missing the opportunity to gain some A-1 prospects. Just be sure that your giveaway is fun and that the prize(s) will be something that the public will find valuable. 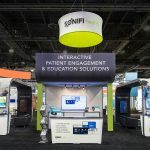 Invest in a great exhibition stand: Invest – and that is the key word – in the best exhibit you can to make your display stand apart from the others. 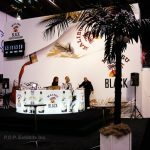 You don’t have to spend a fortune for a custom stand that can wow the audience and put your product in their minds. Hire a celebrity spokesperson: If your budget allows it, hire a celebrity to help you sell your company. The celebrity you choose doesn’t have to be an A-lister, it can be a local celebrity. Using these tips you can compete with some of the larger exhibitors. 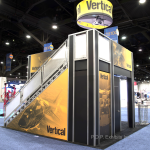 You can also gain parity with the big boys (and girls) with a 10×20 trade show booth. 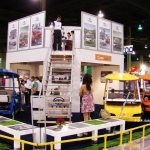 Our custom trade show exhibits can adapt to a variety of different products and industries. Six important things you can do to improve success. After you’ve spent considerable cash preparing and participating in a trade show be sure that when you get back to the office you follow up on show leads. You’d be surprised at how common it is for companies to neglect the leads they gathered at the show. Place proper value on the leads you’ve gone to so much effort to acquire. It’s easy to get up for the first day of a show. Remember that Day Two is just as important. Don’t ignore the smudges, make sure the carpet is clean, and remove any stray candy wrappers. Every day is a new day in Exhibit-Land. Like Disneyworld, it’s gotta look perfect before the guests arrive. If you have a Double Deck Exhibit, be sure and check the upstairs. It’s easy to overlook empty coffee cups but make sure that you don’t! Next, create a checklist of things that your team can improve upon from day one. A former baseball player recently stated that before he left the ballpark after a game he wanted to have talked to someone about his plan for the next game. It’s a good idea to sleep on your plan for the next day. It’s a trade show and it’s usually good to socialize and party during the off hours. Just be smart about it and make an effort to make the time worthwhile. It seems like common sense but seek out after hour events where you can improve your relationship with clients, potential clients or suppliers. If none of that is available then by all means have some fun. Just don’t overdo it and remember that your first priority is to be fresh for the next day. How you unpack or pack your booth will make your life much easier or much harder for the next show. The key to any successful trade show is planning and organization. Your exhibit is no exception. Carefully unpacking the exhibit and organizing the packaging materials makes the assembly go faster and the repacking much easier. You eliminate the head scratching that invariably occurs at the end of the show. When you take the time to repack the exhibit right, you ensure that the exhibit arrives at the next destination in good condition and ready for the next show. This suggestion is more for companies on a budget and needing to make choices between shows. Sometimes you just have to throw your hat into the ring and so to a show to see if it works for your company. You can, however, do some homework before making the decision. Call up industry contacts you have and pick their brains. Ask questions like “What’s your opinion about this show”, “If you were in my shoes and had to pick, would you do this show”. 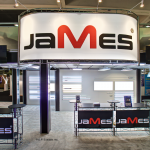 Ask your suppliers or strategic partners what’s their take on the trade show and has it been beneficial? If possible, ask for specifics such as lead numbers, sales from the show, and promotional ideas. What works and what doesn’t work. In the end, you have to decide based on your own experience. Sometimes the show would have been better if only you had done this or that. That’s fine. You’ll make the adjustment next year. It’s tempting to just hang out in your booth. After all, it’s safe and comfortable. But trade shows are two way streets. Potential customers are there to learn and discover new products, services, and suppliers. You’re there to work with those customers . . . but you’re also there to learn and discover as well. Every show is an opportunity to improve your “game.” What are your competitors showing? What are they saying? Are there any new products or services which would benefit your company? Are there trends you’ve overlooked and need to study and implement? No one is asking you to spy, but friendly conversation goes a long way with friends and foes alike. It’s all in your attitude and your approach. Don’t be afraid to say “Hello!” and ask how the show is going. Attending trade shows is a great way to network, gain more visibility and meet potential customers. Whether you’re a seasoned trade show vet or starting trade show marketing for the first time, you’re likely contemplating how to turn more of your visitors into paying customers. The following tips will help you learn how to effectively show off your business and attract visitors who are more likely to convert to long-lasting clients. Research has shown that people are more likely to remember the first and last words when trying to recall a group of names or items they’ve been given. Therefore, if your booth is positioned near the entrance or exit they may be more likely to remember your company after the dust from the show has settled. If you’re able to choose your location, this can give you an immediate leg up and help you make a great first (or last) impression. If you have a contact list of potential clients, send them a professional email letting them know you’ll have a booth at an upcoming show and would love for them to stop by to see what you can offer them. An incentive for the first 10-50 visiting customers such as a promotional item or discount can be a great way to draw people in early, as well as help insure you receive some immediate business following the show. No matter how great your product, the perception of your company can easily be ruined by a cold, inexperienced or unconfident employee. Make sure your staff is prepared, well rested, and ready to address any questions your prospective clients might have. People are much more likely to remember your company if they left your booth feeling like their time was valued and their questions answered. Don’t let a inexperienced staff ruin your image! Bring only the best to represent your company. Keep your decorations simple, informative and eye-catching. Clean surfaces, easy-to-read graphics, good lighting and a few plants can go a long way in creating an inviting space for your visitors. Choose colors that match the mood you’d like to convey. Appropriate sizing is another important factor to consider. You’ll need room to display product, have presentations, conduct meetings or all of the above while maintaining a comfortable flow within your space. Sometimes the best way to make a sale is to let your product speak for itself. Give your visitors time to explore the product while you supervise and answer their questions. You can request email addresses during the trade show then send your visitors an email or two afterward to remind them about your product. You could create a survey requesting their feedback on their experience which could act both as a followup and a way for you to gain valuable information to use at future shows. Just make sure you don’t send them emails that could be mistaken for spam! If the show was small enough and the number of potential clients isn’t overwhelming, consider personalizing your emails a bit. 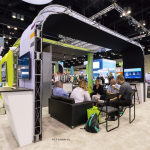 There’s a reason that trade shows are still around in our increasingly digital world. People value human face-to-face interaction and personal connections. Make sure your prospective client knows that you still value them after the show is over!